Thanksgiving is supposed to be a time for family and close friends to come together and give thanks for living in this great country, right? Then why do so many families experience heightened stress and often crazy-making drama that sends shivers of dread through anyone who chooses to host the event? Being with all of these people doesn't have to be a miserable, high-drama experience. One of the biggest problems is expectations of recreating a scene depicted in the traditional Norman Rockwell painting with a smiling family all sitting around the table, eagerly awaiting the perfectly prepared meal they're about to enjoy. This is nowhere near what most people experience, so try to cut yourself and your family some slack. Leave your old expectations behind. This doesn't mean that you have to lower your standards. What it means is that each event is different, even when you have the same people involved. Life experiences have changed, and things have happened to everyone. Accept the fact that, although Thanksgiving is a longstanding tradition, this is a completely new experience. Be understanding of divided time. If you and your spouse have families in different towns, it's likely you won't be able to be with both of them every single year. Come up with a solution, like alternating where you spend Thanksgiving each year. Do this without anger or guilt, or you'll wind up miserable. Be aware of relationship issues. If family members have a long history of not getting along, there is probably nothing you can do to change it. One thing you can do, however, is ask those involved to behave during the event, even if it means not being on the same side of the table. Embrace traditions but not to the point of misery. 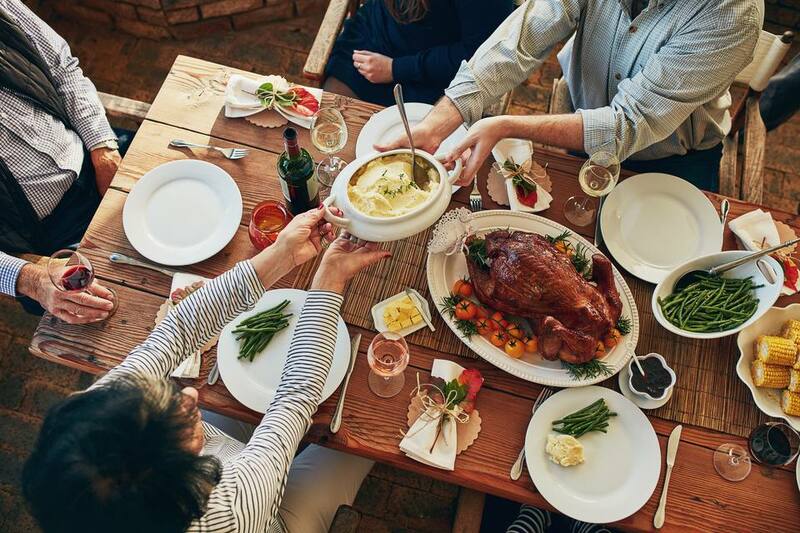 If your family has a Thanksgiving custom, there is nothing wrong with trying to hold onto it—that is unless it creates stress and drama. Evaluate each tradition and only follow it if it works for this particular event. Remember that the most important tradition is bringing family and friends together and being thankful. Be prepared with conversation starters. Even if you know your Aunt Edna can keep the conversation going without any help, prepare a few topics that you can bring up to start a new discussion or steer the conversation in a different direction. This is particularly important if you're dealing with varied religions, opposing political views, or social differences. Offer help. Rather than sit back and judge the host or hostess, offer your assistance. It's easy to be snarky if things don't go your way, but you don't have the right to pass judgment when someone has taken on the monumental task of being in charge of everyone's Thanksgiving memories. Have a variety of food. If you have more than one meat (or meat substitute), vegetable and dessert for your guests to choose from, they'll be happier and not leave hungry. Some hosts offer both turkey and ham, and they ask their guests to each bring one side dish. Remove pet stress. Many pets become stressed when there are more people in the house than they are used to, and they might become traumatized and act out. If you have even the slightest inkling this might happen, provide a cozy spot in another room where they can relax. If you want them to enjoy the party, bring them out after everyone has finished eating, but keep a very close eye on them. Do as much advance preparation as possible. Don't leave all of the cooking until the morning of the big event. Go over your menu and see what can be done in the days leading up to it to prevent the stress of worry about something not turning out right. Know the hot buttons of your guests. If you have a politically divided family, set a ground rule that politics will not be discussed during the meal. If people want to bring it up afterward, it's up to you whether or not it's allowed. This will be a difficult one to enforce, but doing so can prevent a huge family tiff that will last long after the holiday season. Provide dietary options. If you have someone who is diabetic, needs to follow a gluten-free diet, has allergies, or is a strict vegetarian, make sure there are some dishes they can eat. Don't try to sneak something into the casserole without telling your guests because this shows a lack of respect for their needs or choices. Be prepared for extra guests. Although it's rude for someone to bring an uninvited guest without clearing it with the host, this is not the time to make a big deal of it. Make sure you have enough food for an extra person or two. This is a good way to show your gratitude for the family and friends you did invite and to extend a heaping helping of your enviable hospitality. Know how to fix cooking mistakes. When you cook for a large group, something is bound to happen. If the vegetables scorch, remove the ones with burn marks and add something else. You can toss in some diced tomatoes, chopped nuts, or dried fruit to add another layer of flavor. If the pumpkin pie is less than perfect, you can always add more whipped cream to cover up the flaws. There's always a solution to any cooking problem. Find some alone time beforehand and afterward. Spend a little quiet time after meal preparation and before the guests arrive. If you're rested, you'll be quite a bit more cheerful throughout the meal. When the dinner is over and the last of the dishes have been put away, feel free to go into your bedroom for some time to yourself. After all, you've worked hard being a gracious host or hostess, and it's time to relax and regroup. Allow extra time for travel. Don't forget that the highways become congested during the holidays, so start early and give yourself some extra time for the trip. If possible, get there a day early so you won't feel the stress of trying to beat the clock. Don't forget that there is no such thing as perfection when you're dealing with people—even the closest of family and friends. The reason you're all together on this special day is to give thanks for all of your blessings, and this includes relationships. If something happens, like a food burns or someone makes a rude comment, try to laugh it off. The memories will be much more pleasant if you don't let drama ruin your holiday. If no one in your family or group of friends offers to host Thanksgiving, don't fret. There are plenty of restaurants that serve delicious meals. You can all meet there, enjoy the food, and leave with smiles on your faces.